Business dashboards are the front-end of business intelligence. The entire organization be it the production line worker, the sales-person, the finance head or the CEO, all get their metrics using a dashboard. With the inroads made by Big Data and Analytics the popularity of business intelligence tools and dashboards is surging. However unfortunately even with the rising demands, the dashboard products have not evolved in a way one would expect. In fact they are still plagued with issues of complexity, high cost and data-security. Business Intelligence (BI) and dashboards are supposed to provide a deep insight into business but often create confusion owing to their scale and complexity. Basically too much information put together in the dashboard causes information overload. A classic situation observed with business intelligence and dashboards is users getting drowned in it. Data, Knowledge and Information are undoubtedly the most powerful tools that can transform a business, but the real key lies in having the right information in the right hands not all the information in different hands. William Polard had once said that - "Information is a source of learning. But unless it is organized, processed and available to the right people in a format for decision making, it is a burden not benefit." We observe a lot of executives being burdened by unnecessary information through complex and ineffective dashboards that they use. What executives really need is actionable information. There is no dearth of dashboards available in the market however the problem is that all the dashboards are usually designed to target a specific set of users in a company. These dashboards do not tend to cater to the heterogeneous mix of individuals in the enterprise who consume data differently from each other. 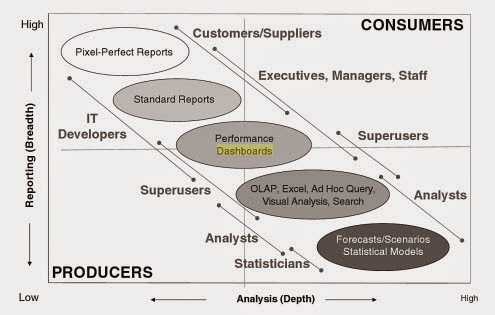 In reality every user seeks or rather needs a different degree of information from the dashboards and BI tools. This concept has been beautifully explained in the book "Performance Dashboards" by Wayne Eckerson . The book depicts the different consumers of data in an organization and how these users like to consume the information available through business intelligence tools. The following image explains the same. For dashboards to be profitable to an organization they must cater to the heterogeneous user mix . Likewise, the reporting tool that aids the dashboard should be able to create reports as per the needs of the heterogeneous user mix. Every user has a different way of consuming data and different need from the data. A reporting tool should be able to match this requirement and present data in a way that it can be used for different purposes be it Enterprise Reporting, Operational Reporting or Analytics. There are studies that reiterate the fact that the ROI for BI solutions depend mostly on user adoption and for Reporting - productivity can increase multi-fold if the tool handles usability and simplicity factors well. Reporting Tools and complexity also clash while choosing the platform. While implementing a reporting tool it is critical to choose a platform that can be customized with a full suite of compatible applications that can work together. The reporting tool must also be compatible with the underlying heterogeneous mix of systems. One of the solutions for the problem mentioned above is to have customized dashboards. However often customized dashboards are extremely expensive and moreover require development by high priced consultants. Then there are issues of license renewals, upgradations and further needs to customize as per different business units which again add to the already expensive solution. The cost with respect to business intelligence tools can also escalate if the reporting tool is not compatible with the underlying systems and platforms being used. Customizing the reporting tool and making it compatible with different business units can prove to be a tedious and expensive project. Another key factor that can make BI expensive is the time they require to combine data from different sources, analyse the data and generate reports. A busy executives valuable time is dependent on the quickness and ease with which the reporting tool can churn information and provide the actual information relevant to him. Moreover excessive wait times result in frustration and user drop-off. Most of the dashboard & reporting options currently available in the market are on-cloud. Though this may seem convenient and easy, it poses a lot of concerns on data security. While SaaS provides tremendous advantages to enterprises, an important issue that often gets overlooked is data security, backup and recovery. Dashboards and Business Intelligence is associated with a huge volume of critical enterprise data that is sent back and forth to the Cloud. In some cases, data retrieval, while possible, can be prohibitively expensive and/or fairly restrictive and time consuming. So while a lot of critical data is being transferred to a SaaS provider there may not be a full-proof mechanism for its recovery or restoration. This is a scary situation that can completely undermine the benefits of adopting a SaaS solution. The lack of secure data backup may also violate the regulatory and compliance norms under which most enterprises operate. With the reporting tool, data security issues appear if the data is being manually fed into the software. Manually fed data is prone to errors and omissions and can pose serious threat of misrepresentation of facts. In today's competitive business world where enterprises need to be fast, responsive, and reliable, losing critical data or delaying the delivery of critical data can be suicidal. In such a scenario enterprise systems need a reporting tool and dashboard system that's evolved and is effective to deliver the organization's needs and here's where we take charge. At CloudIOPlatform, we developed a state-of-the art dashboard & reporting solution that can be built within minutes. Our innovative drag-and-drop interface lets you craft a dashboard interface of your choice and as per your need. You can also easily add drill downs from any dashboard to enrich your user information. Data filters can be smoothly set in by simple click and touch. Our solution also addresses your security concern as we offer them on-premise. You can view the dashboard on any device be it your Mobile, Tablet or Desktop. Our dashboard system is powered with our robust Reporting Tool that is adorned with an intuitive and appealing UI and in-memory analytics. Our reporting tool offers the benefits of easy deployment and installation. It can be easily embedded and integrated with third party applications and easily scaled up to meet changing reporting needs. And the best part is that our solutions add to your savings as they considerably reduce your outflow on tools.